The general aim of this research project is to deliver a substantial contribution to the knowledge of the long-term variability within the biodiversity and density patterns of the macrobenthos and its relation to anthropogenic activities. The database is derived from an existing relational Access database MACRODAT (developed by Drs. Tim Deprez, SMB), which combines taxonomy, geography, and biotic and abiotic data. MACROBEL will contain a full compilation of all available macrobenthos data of the BCS from the periods 1976-1986 en 1994-2001 and will be hosted by VLIZ (Flanders Marine Institute). All samples were taken with a Van Veen Grab (+/- 50 kg) with a sampling surface of 0.1026 m², or in some cases 0.12 m². This grab enables fast sampling. The variability within replicates corresponds to about 13 %, what gives a difference in depth of 0.7 to 1.2 cm (Lie & Pamatmat, 1965). Picture: Van Veen Grab - Desmet, G.
Fast moving organisms (e.g. some Brachyura, Mysida) can easily escape from the closing grab. Hence, the number of mobile species that is found in the samples never constitutes the number of species actually present on the sampled site. The maximum penetration depth in the sediment of the Van Veen grab is about 15 cm. This limited depth range biases the sampling of bigger and deeper burrowing macrobenthos species such as Ensis sp., Lanice conchilega, Venerupis senegalensis, etc). On harder substrates (e.g. very fine sands, places with large gravel fraction) the penetration is sometimes limited to the upper centimetres of the sediment. As the catch efficiency is related to the penetration depth of the grab, it is from the utmost importance that with every sample that is taken the penetration depth should be kept to at least 5 cm. The latter corresponds with a minimum sediment volume of 5 l as was assumed in former studies (see sampling methodology). The ideal impact position of the grab just before a sample is taken should be perpendicular to the bottom surface. 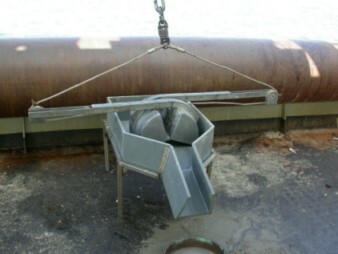 Strong currents or drifting of the vessel can jeopardise a good sampling. It is therefore advised that in such cases the ship would cast anchor. Nevertheless it is imperative to check the contents of the grab with every sampling and to repeat the sampling when falling short of the mentioned criteria. The entire contents of the Van Veen grab ends up on a PVC tray with a funnel like opening and is washed into a bucket using seawater. That bucket is then emptied over a 1000 Âµm sieve and rinsed with seawater until only the coarse sediment and the macrobenthos organisms remain. This residue is transferred into a recipient and fixated with a neutralised (with seawater) formalin solution to a concentration of 7-8 %. As noticed in tables 1 and 2 the described technique differs from the one used during the period 1977-1986. In the latter the samples were firstly fixated in the buckets before pored over the 1000 Âµm (or 870 Âµm) sieve. A gutter was often used for a better separation of biota and sediment. Every sample (already stained with a Bengal Rose or eosin solution) is decanted (10 times) on a 1000 Âµm sieve in order to separate the present fauna from the sediment. With this technique the residue of coarse sediment and fauna is pored into a measuring cup (5 l) and is brought into suspension with a strong jet of water. During this process the smaller and lighter organisms will go into suspension, whereas the heavier sediment and organisms remain on the bottom. The water containing the organisms is there after pored over a 1000 Âµm sieve. All retained fauna is stored in a 4-8 % neutral formalin solution and stained with Bengal-Rose of eosin (if not done earlier). Both solutions colour all organic material. This enables easier sorting of the animals. After decantation the residue is checked for bigger and heavier organisms (e.g. Mollusca, Actinaria). Decantation must not be applied to fine sediment samples (< 1000 Âµm) as all sediment is directly rinsed through the 1 mm sieve and what remains on the sieve can directly be fixated. Nematoda, Nemertinea, Sipunculida, Turbellaria, Actinaria, Oligochaeta and Copepoda are never identified to a higher level because they are not representative for the macrobenthos community. The sampling technique is not suited to quantify these groups neither. The identification of some taxa is still under discussion. Whether they should be identified up to species level or grouped into complexes is still not clear due to uncertain taxonomy (e.g. Phyllodoce maculata of P. mucosa; HarmothoÃ« spp. ; Bathyporeia spp. ; Cirratulidae; Capitellidae). During the period 1976-1986 all sediment analyses were done using at least 7 sieves with different mesh size (see table 1). Approximately 25 g of homogenized substrate was used for grain size analysis of the sand fraction according to Buchanan & Kain (1971). The wet-sieved fraction smaller than 63 Âµm was used as a measure for mud content. From 1994 on all sediment samples were analysed using a Coulter counter. Within the measuring range of 2 Âµm to 850 Âµm the grain sizes are measured. The fraction larger than 850 Âµm is separated and expressed as weighed percentage. The subdivision in sediment fractions follows the Wentworth scale (Buchanan, 1984). All densities are shown as the number of individuals per square meter (ind/m²). Only the anterior parts of the organisms are counted. Macrobenthos is considered to be all organisms living in the bottom of the sea and retained on a sieve with a mesh size of 1 mm. These organisms are mainly bristle worms (Polychaeta), bivalves (Mollusca), echinoderms (Echinodermata) and amphipods (Crustacea).